Assess current efforts to reduce emissions and comply with standards in the federal Clean Air Act. The Committee should monitor the efforts of the Texas Emissions Reduction Plan Advisory Committee established in SB 5, 77th Legislature. Monitor the implementation of the colonia water and wastewater self-help grant program established in SB 312, 77th Legislature. 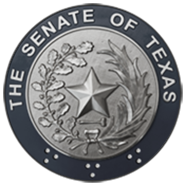 Monitor the activities of the Joint Committee on Water Resources, the Texas Water Advisory Council and the Joint Interim Committee on Office of Natural Resource Public Interest Counsel. Study and evaluate the state's ability to respond to natural disasters, such as hurricanes, tropical storms, coastal flooding, and flooding along the state's river basins; assess the extent to which population growth and land use along the coast and the river basins has increased the state's vulnerability to such hazards. The Committee shall make recommendations on the state's flood mitigation program and state coordination with the federal government and political subdivisions of the state. Study and make recommendations on the research and use of alternative fuels and fuel additives in Texas. The Committee shall assess the cost-benefit of innovative technology in converting solid and agricultural waste into fuel and fuel additives.